I don’t know about you, but I adore summertime. And every chance I get, I take my yoga outside. 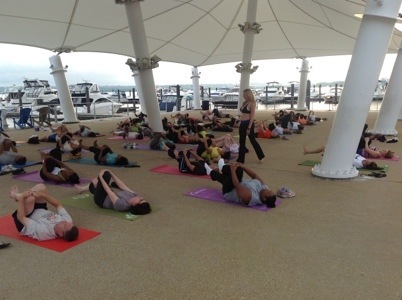 This summer I have the great pleasure of teaching a series of yoga classes at the pier at National Harbor. The National Harbor is hosting free classes on Tuesday and Thursday nights throughout the summer. Come and join us. I’ll be teaching again on Thursday, June 21 and Thursday, July 5. Be sure to check out National Harbor’s events page. They have many wonderful free events this summer.